Over the years I have curated quite the collection of picture books and I have just about the entire series of the Berenstain Bears. Beautiful lessons learned from this furry family. Even now, as I read them to the little ones in my extended family, they make me smile. 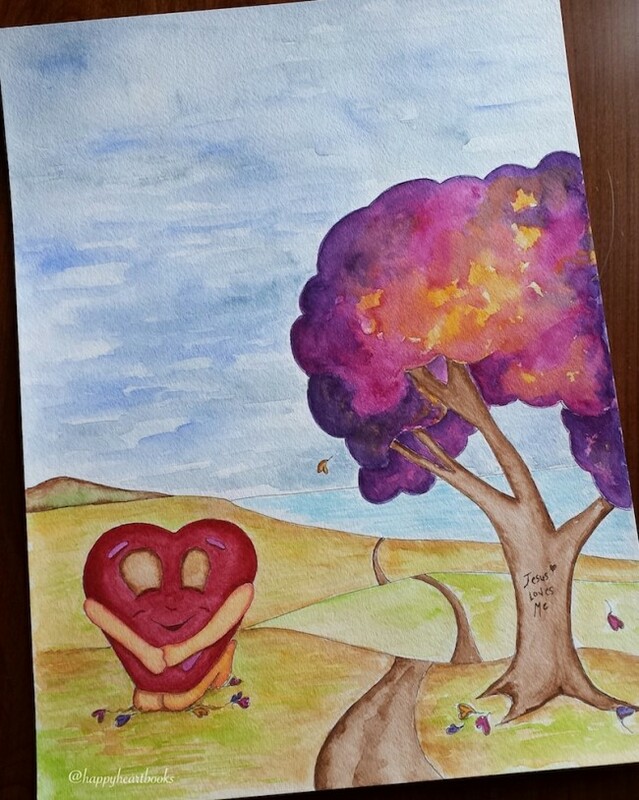 When the message of Happy Heart™ was placed on my heart, it was clear to me to present it in the form of a children’s book. I’ve had the pleasure to share God’s goodness and my own healing story to all ages. It wasn’t until my later 20’s that I started to understand (just a little) how much God loves me and that he wanted good things for me. He is always pursuing us and I’m so grateful that he rescued me. As I learned to lean in to Him and His Word, I was able to live my life up and outward towards Him and not inward in depression. Certainly, I wish I had learned this sooner, but we can never go back. However, God is outside of time and He (ONLY HE) can deposit His Truth into the empty places in our lives, fill in the gaps, and restore us to receive our place as His daughters and sons. Children of the Most High God. From my own experience, I can see why God placed on my heart, “to reach them when they are little”. To plant seeds of Truth that will take root in the hearts of children; so they may grasp the joy and freedom they have in Jesus Christ….and live confidently out of this assurance. The main story line for “Happy Heart: Fill’er Up!” was placed on my heart one night many years ago and I share a little about it HERE. Although, I have always been the creative type, I did not plan to be an author or even have the urge to write a book. However, the story of Happy Heart weighed on my heart and mind all the time. It wasn’t until we lost my 10 year old nephew, Eli, to leukemia that I thought more about the time I have and I wanted to make my days count. 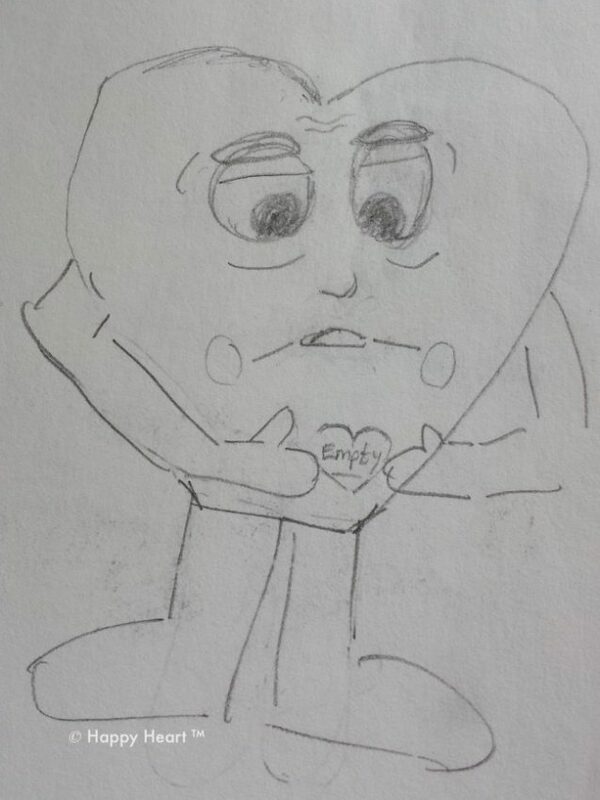 I began to work towards making Happy Heart a reality. 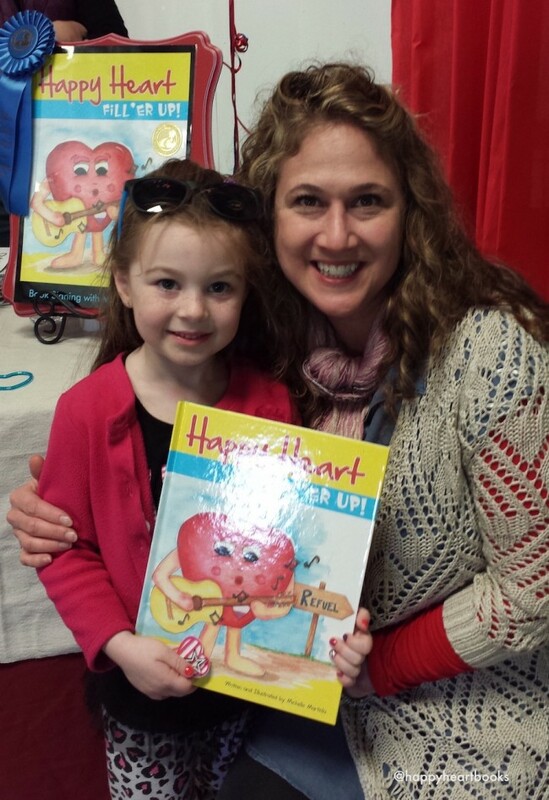 As I hear stories from parents on how Happy has helped their children and receive feedback from kids on what they like about the story, I’m so grateful for following through with completing Happy Heart: Fill’er Up!. How do you write a children’s story or any story? I am still learning about this everyday, but as I begin the process of illustrating the next book in the Happy Heart™ series, I thought I would share what I have learned along the way. Hopefully, it will inspire you in your writing journey as well. The internet is a great resource to start your research. I did find some Helpful tips in writing a children’s book that you can take a look at as you begin. Now, this may be old school, but I used three-ring binders to keep all my information and research in regarding writing and publishing a book. They were just plain white binders. Perhaps, keeping all your files in a computer program works best for you (whether it’s a paper trail or a computer file, just have a designated place to start keeping all your important notes and records (and have a back up file too). One binder kept all my research, records, correspondence and expenses. In another binder, I kept my drawings and ideas for the story. I’ll share more about the contents of the binders and helpful tips/information in Writing A Children’s Book Part II. Really, the first thing to do is start writing. If there is not something specific placed on your heart or mind, write about something you like, are passionate about, or a situation you are going through in your life. I would not worry about sentence structure, grammar, or paragraphs. Just write! As you write other ideas will probably come to mind. Make notes of any ideas that spark during the writing process. You can always go back and explore them later. Now that you have spent time writing and have a better sense of what story/message you want to share, it’s time to think about “how to best tell the story”. Basically, all stories follow a certain structure. Just watch a movie or TV show and it is evident they follow the same format. This format helps capture the audience to continue to the end of the story. The story of Happy Heart came to me in a basic outline. At first, I wrestled with whether or not I should add to it (change it). However, as I prayed about it and learned more regarding the format of storytelling, I realized that what I had was an outline for something more. I needed to fill in the gaps to (visually) give a better understanding to the message of my story. 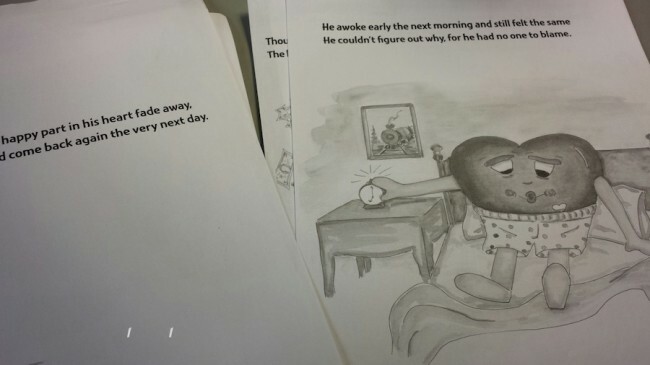 I had 14 lines (compared to the 50 lines in the completed picture book) to be the base for a story. Basically, my outline gave me the format (an introduction, initiating incident, rising action, climax, falling action, and resolution) I needed for writing the story. When I decided to make time each week to complete the story, I also invested time in attending writing conferences and workshops to get a better feel of how to write. I did research and also read a lot of children’s books. After going through several rough drafts (and adding more lines to the story), I began sharing it with some close friends (the editing friends and professionals) and others who were more proficient in writing. This was sooooo valuable and blessing to have others let me know, not just what they liked about the story, but what I need to work on to make Happy Heart’s message stronger. In particular, I learned that when you write a rhyming story, all your lines should have the same number of syllables in them (I must have missed this important and vital piece of knowledge in all my English courses). If your lines have roughly the same amount of syllables in them, then they have rhythm and flow (makes sense). Thisismywww explains it very well in the post, Counting Syllables. Yes, I get it! A rhyming book needs to have flow and rhythm as one makes their way through reading it. But once the buzzer sounded the “happy” part was still no more. But when the loud buzzer sounded, Happy dragged off the court. 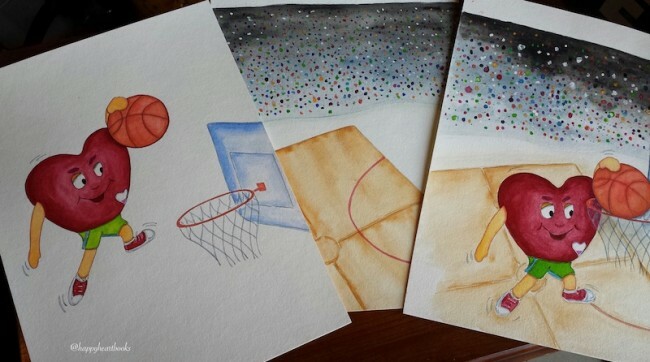 *Pictured above are a few shots of the basketball court scene I illustrated for the iTunes version of Happy Heart: Fill’er Up!. There were a few lines that needed (corrected) to rhyme. To be honest, I dreaded having to go back through and make the changes. Remember, each line had to have the same amount of syllables too (did you count them above???). However, as I prayed about it, each line came to me and within an hour or two, I had lines that rhymed. I believe this process, as painful as it was to go back and rewrite it for the 10th time, it made it a better story. Now, I did not make changes to everything I received as feedback. I felt certain lines conveyed a message/point about God’s love to the reader and if I changed the line(s), it would make the message vague or non-existing. However, I am very thankful for everyone that invested and gave of their time to offer me (honest) feedback. Trust me, feedback is vital!!! I decided to do the illustrations myself. 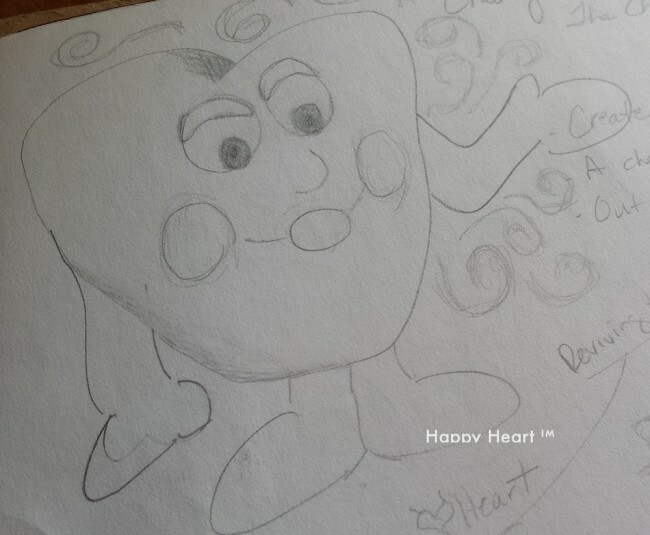 I had a connection and sense of what the character, Happy Heart, should look like. I looked forward to the challenge to bring the story (visually) to life for children (especially, for the little ones not able to read yet). 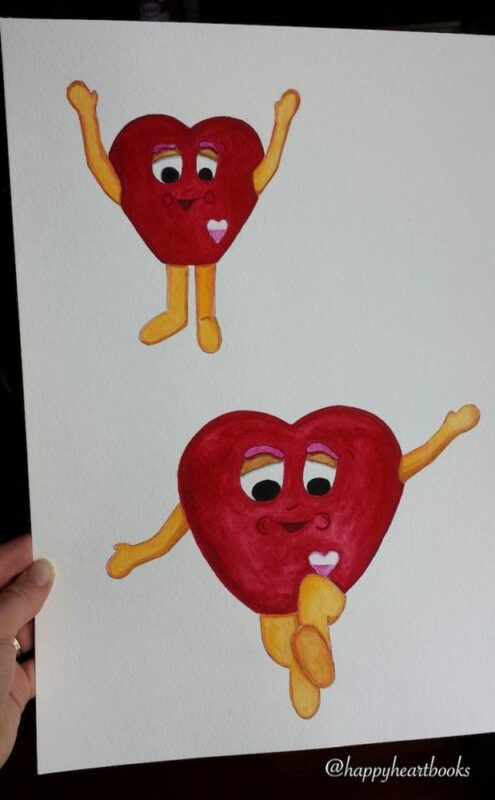 Looking a little more like the Happy Heart that appears in Fill’er Up! 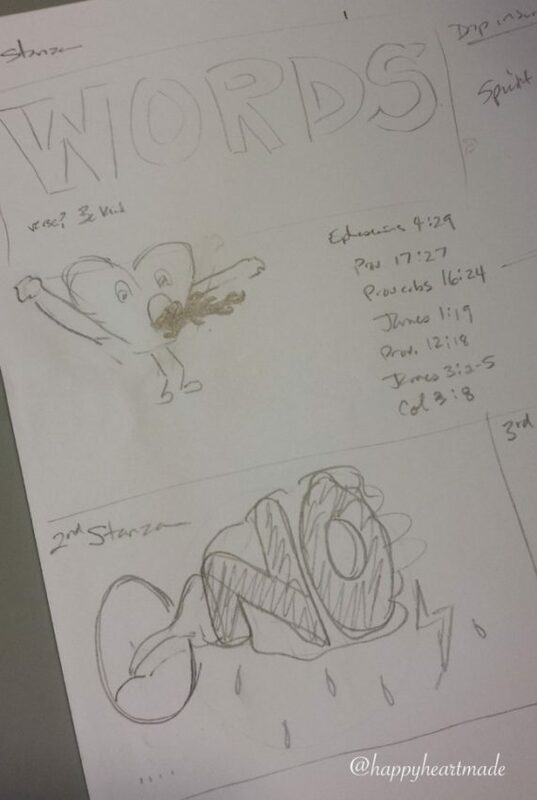 My beginning sketches were thumbnail sketches beside each stanza. I made small (very, very, very rough) sketches beside each line (or two) until I had made my way through the entire story (I’ll share more about that in Part II). I’m currently working on thumbnail sketches as I go through each line/stanza in second book of the Happy Heart series (Here’s a sneak peek!). After I draw (thumbnails) ideas to convey the message of the story, I go back to each thumbnail and begin to draw them larger with a little more detail. 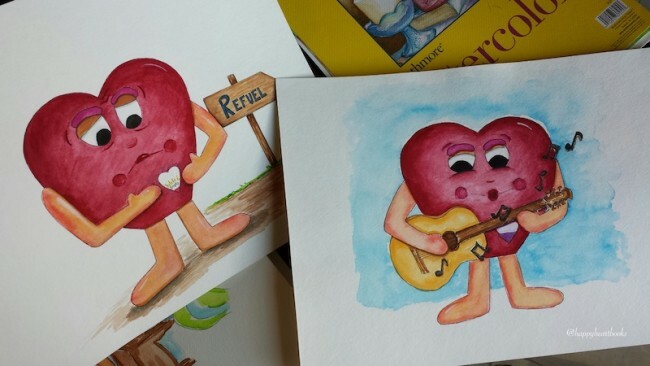 Once I had each sketch completed, I transferred the illustrations to watercolor paper to start adding color. NOTE: Always make your images larger than they will be printed and also darker in color (color tends to fade a little when printed). If it’s larger and rich in color, it will keep it’s sharpness getting smaller (If you have to make it larger than the original it will lose it’s sharpness). At the last minute, I received some great advice that my original choice for the cover looked very sad. Certainly, good to give the sense of Happy’s empty state, but not appealing for a book cover! I decided to not use the one on the left and used the illustration on the right instead. I hope this gets you dreaming and creating. We all have lessons we have learned in life. Begin today to take the steps to share your story. Always glad to hear from you, so please let me know if you have any questions or requests. I’m so glad you shared this Michelle. 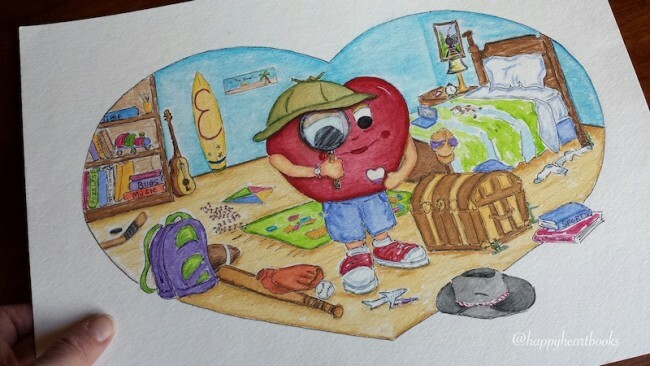 After seeing pics of the kids with their Happy Heart books on Instagram it’s just awesome reading a behind the scenes post about what prompted you to write the book. Your drawing are beautiful and filled with love so it’s really easy to understand why children love your book. And the message is so true too. Michelle, thank you for writing this! It’s so great to hear about how you got your book published and the steps you have taken. I may or may not be thinking about the possibility of publishing a children’s book so I’m definitely interested in the process. I can’t wait to read more of your writing journey. Congratulations on writing the second in the series of these awesome books!